There were 711 press releases posted in the last 24 hours and 153,532 in the last 365 days. All Time Air Conditioning is bringing its services to West Palm Beach and the surrounding areas with a limited time completely free giveaway. WEST PALM BEACH, FLORIDA, UNITED STATES, April 2, 2019 /EINPresswire.com/ -- Uh oh, so it's one o'clock in the afternoon and you walk into your home to find out that your central air conditioning is not working. You, check your circuit breaker to see if maybe the one controlling your HVAC system popped but you quickly discover that is no the case. So, what now? You live in sunny South Florida where the Spring is just an early introduction to the Summer. So where do you go from here? You are pacing around your home by now wondering how long will you be without cold air conditioning, but then something dawns on you... what about your pets? Small pets like Hamsters, Ferrets, Guinea Pigs, and other little critters are all very sensitive to temperature change. The last thing you want is for an unexpected HVAC system malfunction to cause pain or discomfort to your family or child's pet. Well, I have some good news! 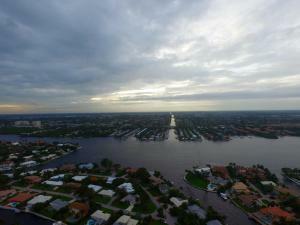 All Time Air Conditioning of Boynton Beach has expanded their reach! For over a decade, All Time Air Conditioning has been a top-rated, award-winning and family-owned HVAC Business located in the heart of South Florida's tri-county area. With their main dispatch located out of Boynton Beach, FL they have provided emergency air conditioning repair and installation services to thousands of satisfied customers ranging from Martin County all the way down to Miami-Dade County who are all now part of the All Time Air family. Raving reviews pour in from all over the internet, from places like Google, Yelp, Yellow Pages, Home Advisor, and Facebook expressing with great satisfaction their experiences with All Time Air Conditioning. All Time Air Conditioning is owned and operated by a South Florida family just like yours, so they have a very clear understanding of the importance of having a fully functional central air conditioning system especially during the spring and summer seasons which for us Floridians, is pretty much one and the same. Which is why All Time Air has made it their focus to provide quality air conditioning repair and installation services 24 hours a day, 7 days a week and 365 days a year. So stop pacing around and turn the frown upside down. If you ever come home and your HVAC system is not working, don't hesitate. Just call All Time Air Conditioning and they will be on-site in 90 minutes or less! They pride themselves in offering 20 years of expertise and quality professional service for a price that will never break your bank. West Palm Beach is a neighbor to Boynton Beach, and good neighbors always take care of each other, is what family-owned HVAC company All Time Air Conditioning says on their website. 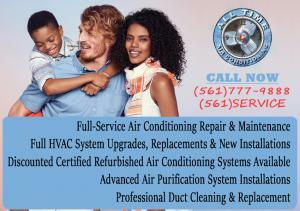 After many years of serving the West Palm Beach area as the top family-owned emergency ac repair service available. All Time Air is wanting to give back to the West Palm Beach community and surrounding area by offering a limited time raffle give away that will last through the end of the summer season! If you are a first time customer of All Time Air Conditioning, after your first service you will be asked to leave a review on google with the tag "ALLTIMERAFFLE2019" in order to have your name entered to win a new Reme Halo UV Light air filtration system installed by the professional HVAC technicians of All Time Air Conditioning. In a recent five-star review satisfied customer and Google Local Guide - Angie D says "Imprese! The after-hours response time was excellent. Had someone at my home in under an hour. Brian is excellent, knowledgeable, cordial. Thank you for fixing our issue quickly. Prices are reasonable in relation to the service. I did a one year contract with them." For more information about All Time Air Conditioning visit https://alltimeairconditioning.com.